Microsoft has laid part of the blame for Bing Maps' mis-location of the Australian city of Melbourne by a whole hemisphere on Wikipedia. Microsoft made its admission after your correspondent took to Twitter on Monday to do what we in publishing call “pimping" the story of Melbourne's mis-placement. 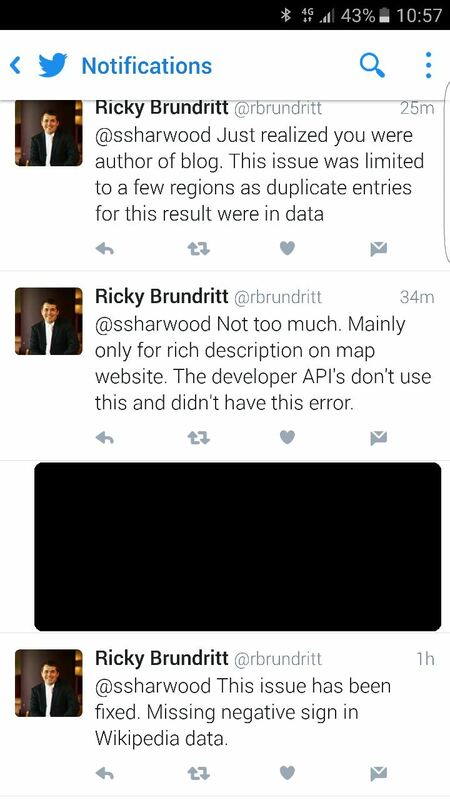 We then pressed Brundritt about the extent of Bing Maps' reliance on Wikipedia, with the following results. We've got a screenshot of the Tweets above in case someone – ahem – decides to delete them. Deletion may be an option because our exploration of the Wikipedia page for Melbourne suggests it had the correct co-ordinates back in February 2012. So there you have it: Bing Maps sometimes relies on Wikipedia data. That data can be edited by anyone and is therefore often contentious.